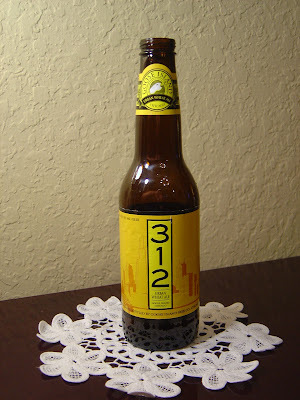 The second little surprise to come home from Chicago last week was Goose Island 312 Urban Wheat Ale brewed by Goose Island Beer Co. in Chicago, Illinois. You'll probably recall from Friday that Fat Tire Amber Ale was the other, and that was a really good start to my weekend. Not exactly sure what the Urban part of the name has to do with anything. I guess it sounded cool. The beer has a very nice lemon and citrus aroma. The flavors are also very lemony with a touch of honey or cereal. Nice carbonation makes the wheat pop out too. I would say that it's slightly light in flavor and the aftertaste is nil, but this is a nice beer, refreshing and I'd definitely pick this up on a hot summer afternoon.